The Age Age Idol Matsuri was a very long minor idol event that took place in Shibuya Milkyway. This is what used to be Take Off 7. It's basically the same, but it seems to have been cleaned up a little. Maru Maru Gakuen Housoubu was one of the guests. 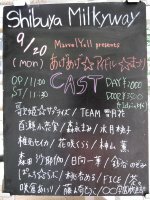 Since the Maru Gaku stage was scheduled to start at around 13:30, I arrived a little after 13:00. There were around 30 people in the crowd. At the end, there were around 40 people. It was an all standing event with no seats. The event seemed to be running late, so the Maru Gaku stage started at around 14:25. Only eight of the ten Maru Gaku girls participated in this live. Ueda Nao and Shiraishi Miki were absent. The girls wore their white parka outfits for the first time. The first song was "Motto Motto Tokimeki". There were only four mikes, so the singers were Saori, Kanako, Kana, and Megumi. 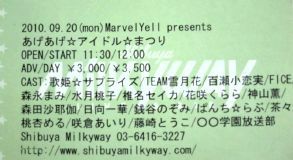 The second and last song was "Seijuu Sentai Gingaman". 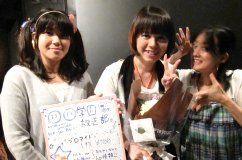 But before the second song, there was a birthday celebration for Saori and Nao, even though Nao wasn't there. Asuka and Touko came out wearing black maid outfits (and wearing masks to cover their eyes) to bring little birthday cakes with the candles lit. For "Gingaman", four girls held the mikes for the first half and the other girls sang the second half. After the two songs, Asuka came out onto the stage wearing a black maid outfit and cat ears. Touko and Asuka sang "Naniga Nandemo" (Sakurakko Club) together. After all of the groups sang, there was a short photo session on the stage. A couple of groups/singers went to the middle of the stage for 30 seconds each. The stage was pretty well lit, around ISO800, F5.6, 1/100. 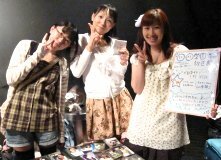 After the event, the Maru Gaku girls came out to sell their photos. 100 yen each, individual photos. I just bought 8, one of each girl that appeared today. Asuka didn't have any goods to sell herself. Photos and videos not allowed of the stage (talk and songs), except during the photo session at the end of the event. But they allowed photos during the goods selling. It was VERY dark.